Modern engineering uses computer models. A model is a simplified representation of a real object or system that captures some limited aspect of it. For example, a CAD model captures its geometry, a simulation model its behavior, and so on. The most effective models combine a graphical representation, which humans can see and understand, with a digital representation, which computers can store and query. Systems engineering is following this pattern. The basis of Model-Based Systems Engineering (MBSE) is that the system can be captured in a single unified computer model. But unlike a solid CAD model, where the geometry it contains corresponds to the appearance of the real object, an MBSE model contains many disparate elements. The nodes in the multidimensional network, as shown in Figure 1 below, may be structural components, behaviors or requirements; the links between them represent composition, flow, or dependency. In common for CAD and MBSE models is the concept of a single source of truth. A mechanical designer can create a top view or a side view or a front view of a component from the 3D solid model by “projecting” it on the appropriate axis, and know that all these views are automatically consistent. Similarly, a system engineer can generate requirements lists, block diagrams, flowcharts and other SE documents from an MBSE model and know them to be consistent. When the model is revised, a new set of documents/views can be generated with minimum effort. SysML has become the standard graphical modeling language for creating MBSE models. Like schematics in the electrical engineering domain, it is a language both universal and precise. A schematic can be understood unambiguously by an electrical engineer anywhere in the world, because its graphical elements are so precisely defined that they are computer-interpretable. SysML is reaching this same status. 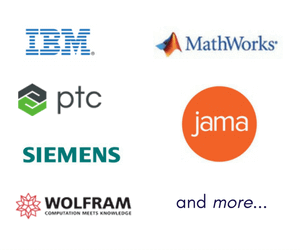 Multiple software vendors provide computer programs to build and visualize SysML models. But SysML is only part of the story. 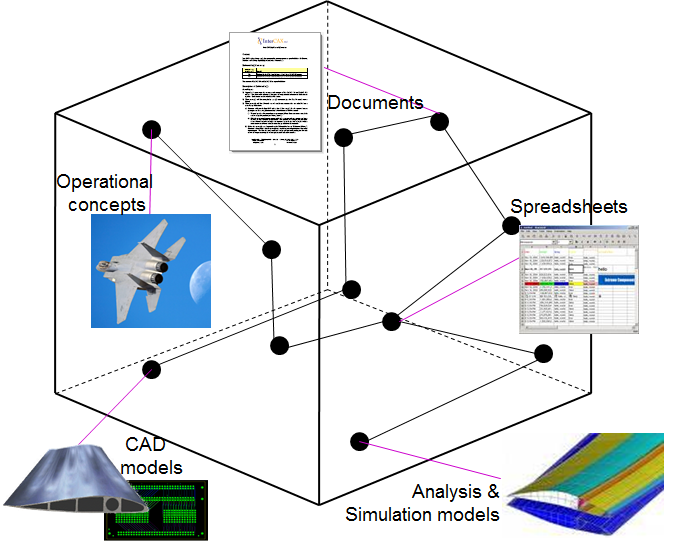 Each node in the SysML model in Figure 1 can be thought of as connected to another model in another software tool: a structural element to a CAD model, a behavior element to a simulation model, and so forth. Our Total System Model (TSM) encompasses all these models and tools, and the connections between them, as shown in Figure 2. The TSM strategy is to use the SysML model as a high-level roadmap of the system and a clearinghouse for critical system-level information. But each element in the SysML model can be connected to other models and tools, where most of the engineering work is done and most of the detailed system information is stored. One challenge in achieving this vision is that everything is constantly changing. It is here that the interconnection between SysML and PLM / ALM / Database model management strategies becomes critical and make systems engineering an important new user base for traditional enterprise data management systems. With Syndeia, system engineers can develop and manage the high-level architecture of a system/product in SysML and simultaneously connect, generate, communicate, and sync with detailed requirements, parts (bill of materials and CAD), simulation models (MATLAB/Simulink, Mathematica, CAE) and complex data structures that are version managed and configuration controlled in enterprise-strength PLM systems (such as Teamcenter and Windchill) and object-oriented / relational databases (such as MySQL). Most importantly, organizations can do this without abandoning their existing engineering software, or limiting their ability to connect with the software of their partners, suppliers or customers. Effective TSM strategies can focus on specific high-value use cases, adopted incrementally to achieve the highest near-term ROI. Syndeia offers a practical way forward to groups already practicing MBSE and those new to the field. Get all our latest posts, SysML models, resources and announcements directly in your inbox.